5-way input audio and video signal input, converted to one HDMI output. Support HDMI output up to 1080P/60Hz, the HDMI signal input support 3D HD source film (24p). 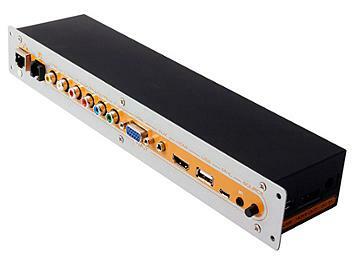 Build-in signal amplifier scales the composite video, YPbPr, VGA signal input to HDMI 1080p output. The HDMI signal input is compliant with CEC, HDCP and 30bit, 36bit,48bit deep color. Easily switch between devices manually or with the IR remote control (Internal / external IR). Plug and play (Except for MHL). do power charge to the MHL device and support RCP function. One Switch Key at the front panel and the other Switch key at the rear panel, the two key have the same function that can do switch at the input video signal sources.